"This is the ultimate evolution of my rice pilaf. I had some extra tomato paste around that needed using. Let's face it, practically no one uses the entire can at once! This easy dish pairs well with chicken." Mix chicken stock, brown rice, orzo, and margarine in a saucepan using a fork. Bring to a boil. Mix with a fork again and reduce heat to low. Cover and simmer until stock is absorbed, about 20 minutes. 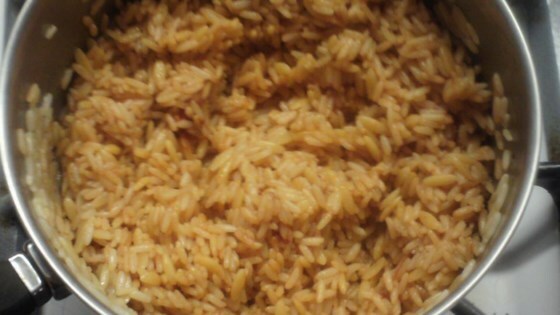 Mix in tomato paste and adobo seasoning until rice is a consistent reddish color. I use homemade chicken stock to make this. I simmer chicken bones in my slow cooker with celery and carrots, then chill in the fridge for 24 hours. After skimming the fat, I freeze it in ice cube trays so I only have to thaw the amount that I need. It tends to still be hot after thawing in the microwave, which means less time waiting for it to boil. You can use store-bought if you want (check the sodium content, though). Substitute butter for the margarine if desired.